What is your story, how did this duo get started, how did you both start creating design? Hannes and I were both active as visual artists. At the end of 2010 Valerie Traan Gallery asked me to create something for the gallery. 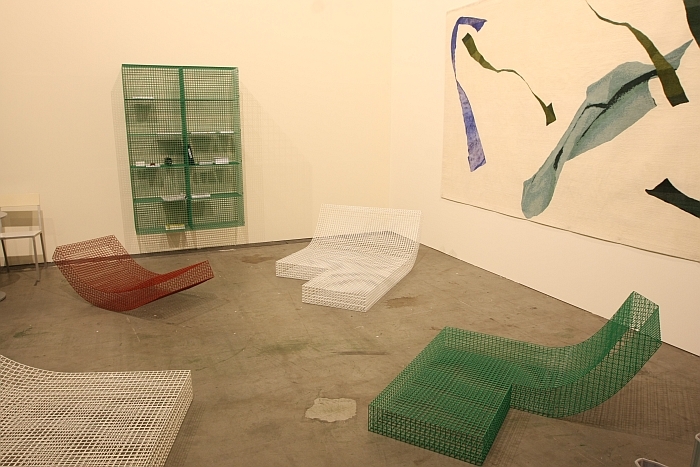 Valerie Traan is used to show work which balances between art and furniture. At the same time Hannes and I were also remodeling/renovating our home. We had a problem in our living area with the electricity above our table, from this problem one of our first works sprung: table + lamp. In a few weeks time our collaboration arised and we had our first show at Valerie Traan Gallery in 2011. Muller Van Serveren was born. Most of the people we interview love to blur all the boundaries, but with your work it is especially the case: the boundaries between art and design (some of your pieces are more sculptures, even 3D pencil drawings, than pieces of furniture, but others are real pieces of architecture), between solo and collective work, between minimalism and total fantasy, between harmony and contrast. Does the fact that you are artists producing design change your perception on design? Did you feel there was a special need to remove the partitions in design? We definitely see it as functional objects. Lying on the borderline with arts, is due to the fact that we create furniture as visuals artists. It’s just our way of creating furniture, it’s not something we consciously seek, it’s more like a consequence. It is very interesting to have a look at both of your previous work, to see what each of you puts into this duo. Could you tell us what is your function inside this duet? Fien for the colors, textures and the patterns and Hannes for the shapes and the concepts? We don’t have a permanent/strict function in our cooperation. It’s always different for each object. Sometimes it’s Hannes that comes up with an idea, sometimes it’s me. Sometimes Hannes has an idea towards finishing, sometimes it’s me… However, we are in a constant dialogue with each other about what we’re creating, we draw on each others drawings etc. But is never a predefined method or measured organization about the process of making an object. The words « incongruous » and « absurd » are used in your biography. And we, at HLOW always compared your work to Jacques Tati’s furniture set in the movie Mon Oncle. When he was shooting the film, Tati was at the same time fascinated by the esthetics of modernism and making fun of its pointlessness. What is your link with function and dysfunction? You have worked for Valerie Objects and collaborated with Fischli & Weiss? Could you tell us a bit more about these projects? Is it on purpose that we can find your pieces only in galleries or decorator spaces? Valerie Objects came to life through the collaboration with Valerie Traan Gallery. At a certain moment Valerie Traan saw we struggled to design and to remain creative, because the production was taking too much time. The initial idea was to outsource a very big part of the collection to them. It proved to be a difficult process to mass produce all of the Muller Van Severen objects, so a couple of months ago, a large part of our design was returned to us.